January 20th: Annual Meeting Coming Soon! Hope you are all staying warm in this windy weather. We look forward to seeing you at our upcoming Annual Meeting on Thursday, February 4th. If you haven't seen an email invitation yet, please contact Sara as you should have received one last week. Currently Available This Week: apples, beets, cabbage, carrots, celeriac, chard, garlic, kale, kohlrabi, onions, parsnips, potatoes, rutabaga, salad greens, sweet potatoes, turnips, winter squash, parsley and rosemary, wild mushroom medleys, and more! We also have delicious bread, bagels, yogurt (NEW lemon flavor), pudding, cheese, eggs, maple syrup, granola, cider, condiments, and local beef, lamb and pork. Welcome to Basin Farm in Westminster, VT. Basin Farm has been a member of Windham Farm & Food for many years. 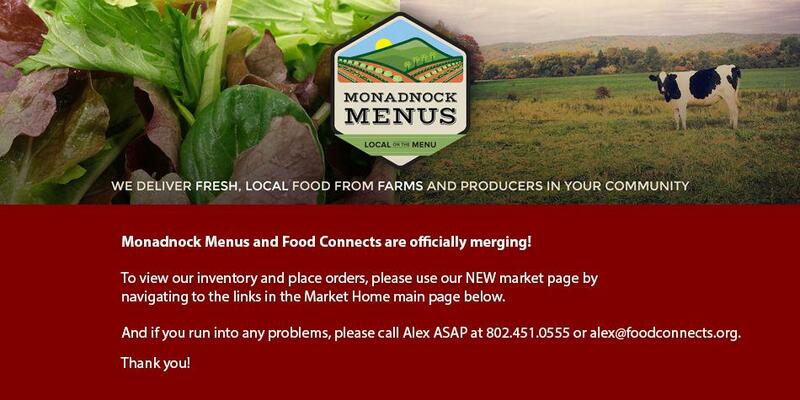 We asked them to list some of their produce on Monadnock Menus as a number of our farms did not have as many storage crops for this year. We are working on supplementing our offerings with a couple other NH farms that are outside the county, to get us through the coldest, darkest months. Please let me know if you have any questions. Thanks again everyone! Hope to see you on February 4th! MM Annual Meeting: Thursday, February 4th, 12:00 - 2:30 pm (lunch provided) at Stonewall Farm, Keene. Organic Red Cabbage. 25# cases.